Ask me my favorite demo of E3 2018 and I've got a lot of answers, even after two days. Cyberpunk 2077 was incredible. Metro Exodus made me want to play for 30 more hours, at least. Assassin's Creed: Odyssey has a lot of potential. But I'd also be tempted to say the Xbox Adaptive Controller. 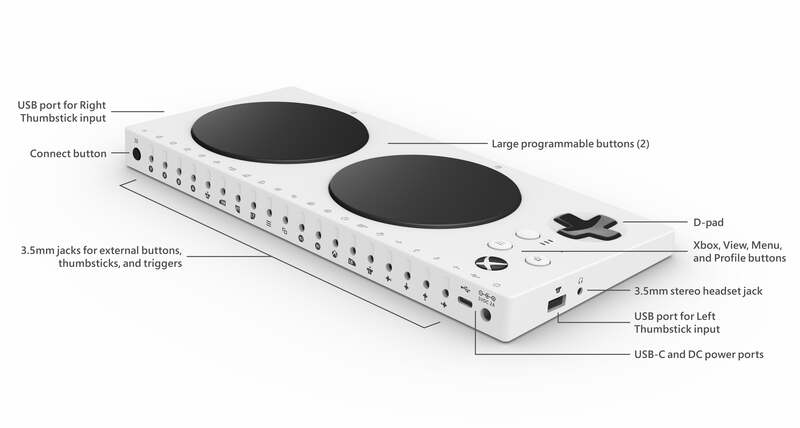 Announced a few weeks back, it's Microsoft's attempt at a controller for people with disabilities—an official controller, one that works seamlessly with the existing Xbox One and Windows 10 environments. That's exciting. The gamepad has been a standard for 30 years now. It's iconic—almost synonymous with gaming (much to my chagrin as a mouse-and-keyboard fanatic). But the gamepad doesn't work for everyone, and video games are meant for everyone. Interface issues shouldn't be the barrier between people and this fantastic form of entertainment. The Xbox Adaptive Controller thus tries to make games more accessible for people with disabilities. It has two large, easy-to-hit buttons. It's sloped, so you can rest it on a lap or use it on the floor. It has a built-in battery, so no need to pry open a hatch and insert AAs. And most important: It has a row of 3.5mm jacks on the back of the device, the universal standard for third-party controls geared towards accessibility. Those who've already invested in an expensive setup or custom-built their own don't need to change anything except the central hub. The Xbox Adaptive Controller's features. It's a fantastic move on Microsoft's part, and after hearing about it for a few weeks now I was excited to see it in person. We played a bit of Minecraft behind closed doors, one-handed. Microsoft demonstrated how to remap controls, and you can even set one button as a dedicated "Switch" function. Like the Steam controller, it allows a single button or analog stick to act like a second with the use of a modifier key. Really neat stuff, and a really attractive and sleek peripheral to boot. Check it out, as we go hands-on (or at least get our hands-on) the Xbox Adaptive Controller above, plus check out the suite of third-party peripherals Microsoft brought along as a demo. You can preorder it now for $100 on the Xbox website, ahead of a September launch.